Francine and I have become fans of the Tour de France. I think one of the main reasons is that, after a 6-ish-week trip around France in June and early July, the three weeks of Le Tour when back at home lets us down gently; the television coverage is a great way to enjoy some of the finer sights of the French countryside. 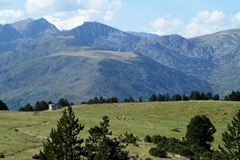 This year, one of the mountain stages of Le Tour finished at at the Plateau de Beille in the Pyrenees. 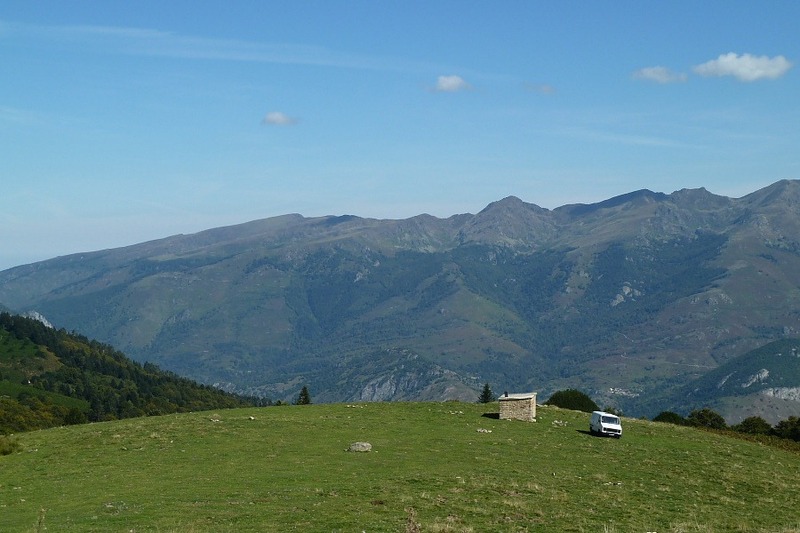 It is very close to one of our favoured Pyrenean haunts, the barrage de Soulcem, about 1½ hours drive away from our campsite. On the TV it had looked very attractive so, to try somewhere new on a fine day, we popped off to have a look. The road up the mountain to the plateau was interesting from a number of standpoints. Firstly, as is the habit on Le Tour, the road surface was still colourfully painted with the names of various of the star riders as a sign of support by adoring fans. That somehow made me feel closer to the real action, albeit past. Second was the gradient. The TV coverage tends to talk of “average gradients of 8% (1 in 12) or 10% (1 in 10)”. This doesn’t do the efforts of the riders justice; some sections feel dramatically steeper, especially those turning a hairpin bend. It was hard enough to drive up let alone cycle up … and at some speed, too. My admiration for the professional cyclists’ fitness increased tremendously. Thirdly there were a couple of related sights that just left us wondering, “how the hell did that get there?”. Yes, there’s a decent road up to the plateau but, even given the French flare for parking, there are certain places that I don’t expect to see vehicles parked. Here’s a couple of photographic examples, hopefully demonstrating what I mean. Goood views, though! The plateau de Beille is a winter ski resort. 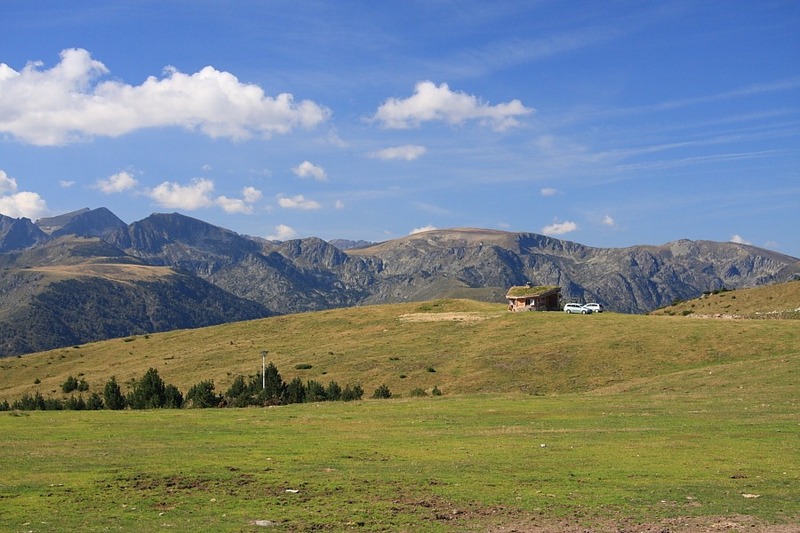 In summer, such places can be very drab, dead places but not the plateau de Beille. Here we found several sentiers [footpaths] with circular routes of various lengths for walkers of varying fitness/abilities. We chose one that claimed to be 1¾ hrs long and facile [easy]. “Lazy tykes!”, you might say. Well, yes, I’d trend to agree but, in mitigation, I’d offer our knowledge of other European walking grades, notably those in Spain. We were a little wary first time out. Everything started well and, as we thought, facile meant quite a lot of uphill gradient to begin with. About half way around, the other typical French problem struck: we lost the balisages [waymarks]. Stumbling around we came a cross a French lady and her dog; she went to great lengths in French to tell us that the path was not well marked. We could but agree. We had been follow some other walkers (those in the photo), clearly on the same route. They had disappeared into some trees though we could see no obvious path. As we were stumbling around searching for way markers, this same group of walkers returned. They happened to be English, had lost the path, had given up searching and were going to make their own way back to the start point. Curiously, one of the ladies claimed to have done that route before. Eventually, after determined searching, I did find the intended path and we continued making our way back to the skiing station from which we had begunb along the official route. There was a lot more up and down. However, even allowing for our going around in a circle or two searching for the track, the walk took only a little over an hour.